MOM is resonant of a support system during all times, however high or low one feels. She has been so for me as well! A complete symbol of strength that has always left me to decide what I wanted and preferred. There has never been a pick on my grades or on my choice and never the pressure factor of ‘what next’? I relate my upbringing with her, more so ‘by her’, not through the subjects we studied together but through the life’s precious values of morality and ethics. She used to relate to her Moral Sciences classes back at school and we used to wonder if the current syllabus is anywhere near it, though far reached in the technology arena, it still has got to improve when it comes to Moral Sciences and Life’s Lessons. Our rational thinking and reasoning based outlook definitely needs to be a forerunner to the current day rocket and planet science! Technological advancements have moved us higher in the life’s standards, materialistically to quantify, but to qualify; we still should need the very basic values of life – empathy, sympathy, compassion, integrity, love, affection, humanitarianism , to name a few. Many a time it leaves me with wonder if my mom did take a right step or not so right one, since, in the present e-era, there is no much time for anyone for show casing of values against each other. It has become not a rat race, but a nano race for cutting edge of aptitude. How do we measure our cutting edge attitude? Remains to be a million dollar quest! Time ticks and it was still ticking in its own pace when it was time for my under grad. Engineering Entrance exam did go by well and it made me realize the bond I shared with my mom and vice versa. The decision of joining a University away from home came from me owing to its reputation. My mom stuck by my side of the choice as always and did not say a word thinking that would hurt her daughter. It also made me realize a global factor on education. Wherever it is given the studious or the sincere most will continue to be so irrespective of the reputation of the school or its staff members. Subjects remain the same. Quality remains the same; it’s the package that comes through to us that differs. It’s the arena in which we learn differs. There was again this decision change of visiting the NIT and hence I joined the regional university, Andhra University College of Engineering having known its quality and top most positions amongst Indian Universities. My mother seemed to have been happier than I was and Dad too stood by my decision without reservations or second thoughts. We (Neetha & I) were both concentrating on our work items individually, of course being away. Her peculiar character of not checking messages or calls on time though annoyed me in the beginning questioning the necessity of a phone; I got habituated with this behavior. We did have a good exchange of texts and emails. She used to keep an eye on my status since I was looking out for a new job offer. 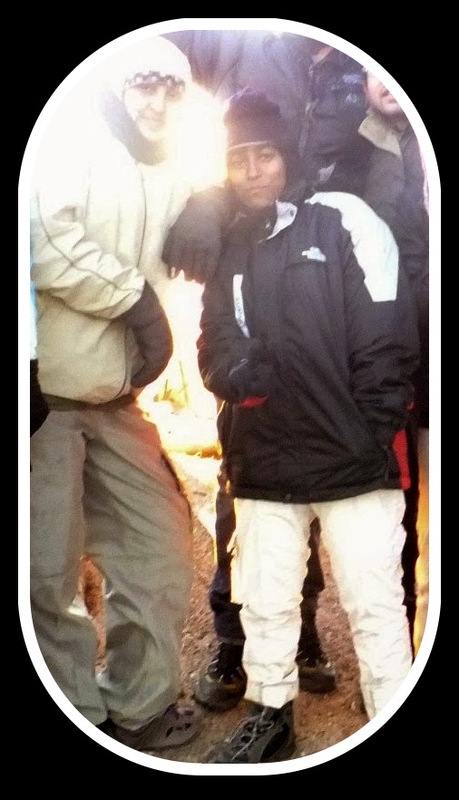 This time bridged the gap between Ruthwik, Neetha’s hubby and I when we never got to speak a word in Darjeeling! Not just this bond, the bond between my mom and Neetha also grew stronger. Mom was amazed by the fluency of language that Neetha portrayed on Telugu. They both started to interact often and had a few routine topics to connect – family and cooking! It was in Dec 2014 when Neetha called me to share the happy news from her end, though shocking strikes on me! She was moving to Copenhagen, Denmark to join Ruthwik who had traveled onsite for work. It was less than 20 days but she wanted to meet me before her departure. I then decided to pack my bags to meet Neetha at Bangalore before her departure. It was a pleasant surprise to meet Neetha’s mom in Jan 2015. Another inspiring model for a life time which made me realize that all MOMs are! Another good old friend from our circle also joined us, Sushant, which made the occasion even more special. The night chit chats continued till the early morning aroma with the tiredness setting in. A few more funny conversations were caught with over a green tea after the late night nap! Bidding adieu was the most difficult challenge until date, but we had to do that since each other’s tasks ahead demanded our individual journeys’ start! This was the second time we met but most contended and happy from both the ends. Time did not change the flavor of the bond through its ticking. 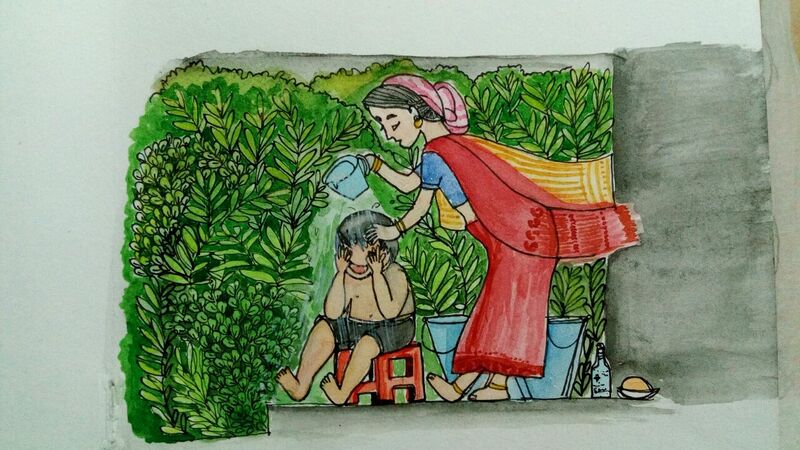 She remained to be my Mother India (MoIn), I retained my title of ‘crazy little girl’. She had to move on to Denmark, and me, Madhya Pradesh for my Training! We meticulously learn by living examples than a well-constructed prose. Shweta is one from whom I learnt a lot or organizational and leadership skills and also the management of people. Coordinating a group of naughtier kids sounds relatively simpler when the task is to coordinate a group of youngsters. Just the mere missing innocence factor makes all the difference. One of the most important lessons learned during the training sessions at Madhya Pradesh. Having an enriching experience of coordinating and organizing cultural and tech fests at school and college made me under estimate the skills required to arrange for a cultural event at the training session. I realized that not all approach any of the concepts portrayed with the same level of thought or acceptance. We have had ego clashes of ranks and thereby the listening / acknowledgement to a junior ranked thought by the senior one was shaky. When everyone is small, they carry with them the innocence; and as we grow up ego and pride overtakes every step of ours thereby making the innocence to be vanished off in the atmos. When I was undergoing pain areas during this cultural organization, Shweta extended her psychological favor that uplifted me of my own thoughts and understanding of people’s mind. How we react and respond to any situation that blooms up is within our reach. Shweta has an administrative brain along with a diplomatic aura that keeps her shining from the crowd. She is simple, yet powerful. She is gentle, yet very positive. I have also learned from her that losing temper will not take me anywhere with the milestones being ahead of me. Yes, I for one could be stripped off being angry for the toll of situations. But Shweta analyzes it well and plays her coins in such a way that she doesn’t allow herself to be angry of anything or anyone. She is an administrative aspirant that sinks in with patience and the right move at the right time, which is given a cent percent credit from my end. One should not correct others by being a good leader. A good leader is one that will live by example and motivate to correct oneself by hunting through the journey within the self. Life’s most valuable lessons are better learned by the self than preached by external sources. She is one of a kind, especially for me. She became my pillar of strength. Shweta managed to hold the pillars high along with my parents who are doing it for me. She leaves me in awe to resonate her qualities of being simple, jovial, loving and caring, yet with an impactful intelligence! Though I have my roots with a family that has cuddled administrators, lawyers, doctors and engineers; it is from Shweta that I associate my administrative skills. This way she turned to be my God Mother during my march for the civils preparations. As we became close, my doubts on how could anything be unconditional in this life kept springing up. Since there could be an emotional movement when the closeness if felt, but over time, I have always felt and believed that it will fade. Change is the constant law of nature. The feeling of oneness did make its way in. Though I stay far from my home, Shweta never let me feel I was lonely as she became my other mom! She turned to be a guide, like my dad; best buddy, like my brother; above all a best companion with a friend in her! She made me feel complete even though my completeness remained to be my family. She became my family as she was very comfortable in sharing her thoughts and opinions with me, than others. I did not get to judge her since I knew it wasn’t the right way for anyone, but she resembled my mom in all that she committed herself to. The patience from deep within, the compassion and empathy running in her veins and nerves, the wit and charisma that she carries gliding through situations to tackle them in the best possible way makes me echo that she is complete, just like my mom! Though I have always cherished and liked short term relationships, than long, since the thought of what happens in case of a separation brings in lesser trauma in short lived ones; I know for sure that my mind and heart are in sync when it comes to Shweta. She has to be with me throughout for eternity, though we are not, like my family! I do not mind to think of this since the weirdest thoughts are sometimes the most practical ones (of course when emotion rules over)! 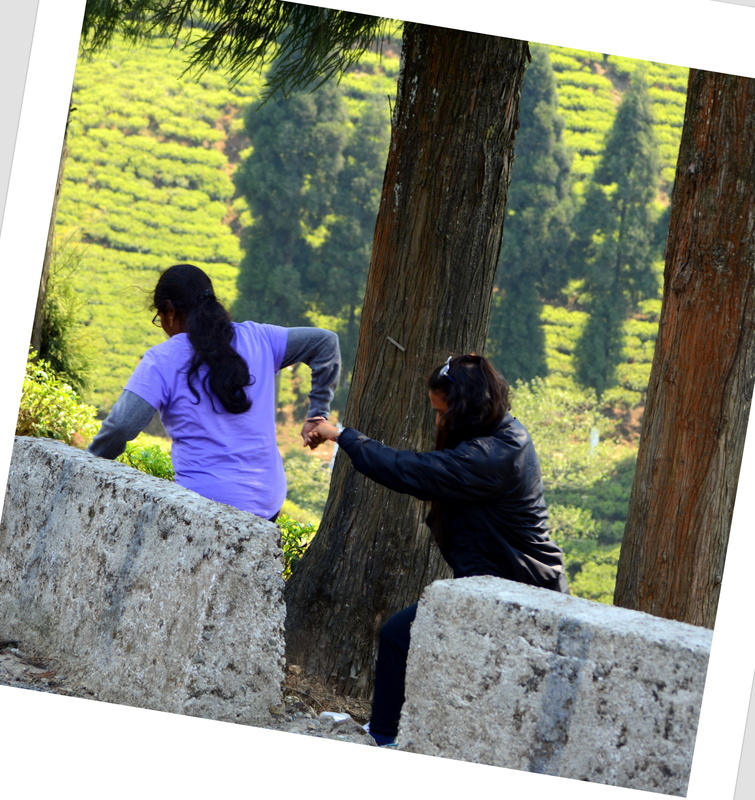 Silly fights, picking anger over Shweta, brain dumping with stories, sense of accomplishments during the training session, relishing the instant noodle cooking, and the women talk, bunking yoga sessions – the trip down the memory lane is as inspiring as the relationship was woven together. A college life relived! Shweta is not very close to anyone else than Anshika and I. Many a time I have given it a thought that it could be because of me – I have not given her the time and space to mingle with other members of the group. With a blink of an eye, months rolled by when it was time for all of us to move to Delhi. She was based out of Delhi too. Anshika, Rohan, Shweta and I headed to Delhi on Apr 22, 2015. This was for the next course of our training. It was a big change to adapt – from the greener pastures to the most concrete jungle. Shweta was allowed to visit home during the weekends (a consolation). During the training sessions she wasn’t allowed to since the rule was for everyone to stay in the hostel accommodation provided. There came the first weekend that we had to stay apart when Shweta visited home. I tried to keep myself occupied with a few tasks passed on by Shweta, like book reviews for example! Did I ever realize that this change and loneliness is going to stick on to be a permanent one? No, I have not! There could be no reason why we will be together even post the training session and this could be one of those rehearsals that we need to get used to, than blame. The phase, altogether a different one, is having a new aroma. Let us wait with patience to inhale it deeply!!! The ultimate goal of living a life of togetherness between two people, who are different in their thoughts, opinions, way of articulating situations, values of life, way of living, commitment to adjust with others; is to find the inner meaning of a relationship that’s eternal, a relationship that pronounces two individuals as bonded through the institution of marriage. It is very easy to break and withdraw cash from a fixed deposit, but the years of recurring that has gone into this fixed account is invaluable when compared to the final cash on hand. So is the relationship between a husband and a wife. A mere law could give a formal / legal separation, but the years of bonding in keeping it together is certainly not worth a rash second of a separation thought. After two years of successful marriage, my mom gave birth to the girl who is narrating it to you now! Yes, the one and only me! Along with me, they also had a baby boy, my younger brother that made the family a complete one. If you feel that’s complete enough, we all did not! There was another bundle of joy to decorate these relationships – that’s Juicy, our pet dog! She joined after 2 years of my brother’s birth and was watched by everyone, especially mom,who looked after her just as an individual member of the family. One of my fondest memories is of my mom feeding my baby brother and Juicy with baby food – cereal during the nights when they both used to cry and then make them sleep one on each side of my mom and dad and alternate after a while. It was a perfect home. My MOM’s love has always been like an ocean – limitless and endless with her patience level reaching for the skies. She has learned to be resilient and independent over the years. She knows to paint, design dresses, a perfect chef in all aspects – being a master of everything that she learns and practices – has always been with utmost interest, satisfaction, perfection and enthusiasm. My grandmother will definitely have the sigh of relief of upbringing her daughter in a way that has been always revered! Anything that’s going so well will also be tested by the Supreme. When I was around 7-8 years, a strong wave hit us to test. Mom was diagnosed with Typhoid, Malaria and a brain fever, when we were too young to understand the situation. She gradually recovered over a month and we were relieved that she will be home with all of us. Grandmother took care of us when mom was away. When we feel dreadful about the situation we were into, my MOM constantly resonated on the faith that nothing can take us away from her. A mom gives everything in the world when it comes to loving her children unconditionally. Realizing that mothers are the living goddess on earth as the Supreme blessed the Mother Earth with! As our mothers spend time with us, it becomes equally our responsibility, especially as we grow up, to spend quality time with them. Giving back a portion of unconditional love to our parents can exceptionally bring in flowery moments between the families. It is never too late to extend a warm hug to our MOM and just whisper in her ears that you too love her..!.. … It was a decisive day for me… Yes, my pain had overridden my conscience and I had to decide between the trek and my pain. A portion of my mind was with me to carry the trek forward without abandoning it after the first step, but a strong another quarter was deeply worried about the injured leg as I was barely able to move ahead, in a literal sense. Neetha gave me the support and push I lacked from within. She was literally my backbone of the trek that day and far ahead. She kept a watch on me consciously as I was juggling through the pain pinch and the trek. It was the final day of our felicitation when we came to know of our guide Pemba’s story. Pemba is a young boy from the Sherpa community and the sole supporter of his family in the absence of his father. He has remained to be an inspiration not just for me but many others who have gotten to know about him and his experience through the journey of life.When we (almost around 40 of us) heard his story, everyone was sympathetic but Neetha couldn’t control it on her tears. She left us all behind, shutting off her doors to be solace. Later once she could console herself, she came out to address the boy as her own younger brother. Neetha is in constant touch with Pemba even today and the boy is all in praise of her sister when we both speak. This nature of Neetha has always made her special to me! When I think of these days when we all rush against the pillars and posts and leave behind no time for ourselves, these memories overtake as they are not so long in the past. We are in an era where love, affection and care if not expressed and extended will become extinct and take its place in the labs and museums. Neetha and I had to bid adieu to each other as well, as it was the final day of our trek and I was heading towards my place and she her uncle’s place Kurseong. No heavy thoughts and emotional drama! A small sigh of touch from her end, and a warm hug from mine were extended when our minds did not think to see when our paths would cross again! It used to be just a few simple text messages and not even WhatsApp or FB since MoIn had a basic version of mobile for texts and calls. Am a quick responder to texts or pings or calls, but she isn’t which sometimes pushed me off the pace since my texts if not responded, the calls would go unnoticed as well. This was because of the fact that she is far from the e-era of communication. She was (and is) closer to her heart’s era of “living the simple life”! MOM and DAD – The Knot’s Essence! Marriage is an enriching experience where two families get together, not just the bride and the groom, but everyone, heart of heart and mind in mind, bridging the differences into one integrated family! Integrated families do see separation soon after the occasion since it’s the Hindu tradition of having the bride leave her home and enter her other parents (in-laws) home. My MOM being no exception did carry the heavy heart of leaving her mom alone when luckily her brother pitched in to stay with his mom along with his wife. My DAD received posting in a remote village which was reachable only through the waters and not by road. MOM and DAD decided to stay apart till the time DAD could get either a permanent posting or in a location where regular life is accessible. Though it was staying apart for the bride and the groom, the bride, of course my MOM had to stay with her in-laws. There have always been dreadful pictures of life after marriage and how the relationship and understanding levels are way too different between the various law-relationships! MOM being a symbol of compromise dedicated herself to the commitment of adjustment and reciprocation to her “new” but “very own” family! I for one have always questioned MOM for being a personification of patience and compromise, and her answer always amuses me – “whenever I think of doing or thinking something that’s against the people of the house, my MOM comes to my mind”. Both the praises and the blame game goes to one’s MOM for upbringing the kid in our society, and my MOM was very particular on earning the best name for her MOM. The pair of eyes seems to hold an eternal bond of the twin pair and hence follows suite like that of the MOM-Daughter combo, I feel. The feelings of one will certainly influence the feelings of the other, in both the cases. As Almighty listens who performs their duties without expecting any results: so did my MOM’s prayers were blessed. DAD got posting in an area that’s accessible to residential living and hence they decided to stay together. The couple kick started a new life, with all hopes, fun, pleasure, pain, understanding, misunderstanding, wishes, fancies, fantasies and the bond grew stronger with the new arrival into the family – THAT’s ME! Yay! Every relationship gets purified and continues to stay afresh when the element of compromise and forgiveness is mixed together with love and affection. My MOM did tackle the relationships as how it needed to be even when DAD tried to take sides unknowingly (may be knowingly as well since at times its too hard to resist through a priority when it comes to relationships). One’s strength becomes another’s weakness and vice versa. All set and ready to go. We headed to our major base camp to gain a set of instructions with some food packages to carry along. We received nice gift packs filled with toffees, peanuts and sesame bars. Post waving to the next batch, we boarded the vehicle to Maane Bhanjayang, the place where our trek starts. I came to know from Neetha that Ruthwik was suffering with back aches owing to bad spine and that he was not going to join us with the trek. Hence a trek with just me and Neetha where we could spend more time to understand each other better and strengthen our friendship. It’s a three hour travel from Darjeeling which took us through the beautiful valleys and mountains. Apart from the serene that I was relishing, I was listening through the talks that Neetha was engaged into. 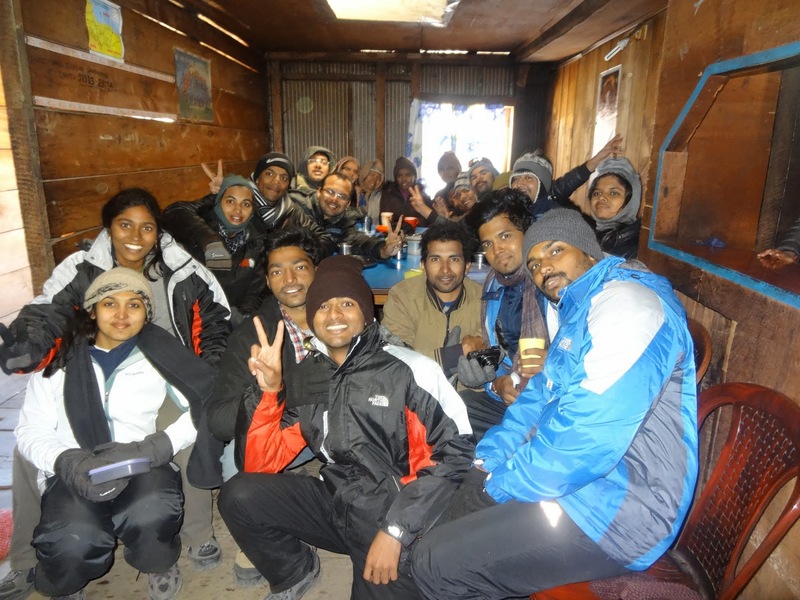 We reached Maane Bhanjayang and procured a food pack to keep ourselves energized on our way to Tumling. Tumling was our base camp. It was an 11 km trek from Maane Bhanjayang to Tumling. The first day was spent with the gang of friends that I already knew from the time we started when Neetha was getting new acquaintances. I was silent watching Neetha as she indulged well in group discussions when it came to exchanging views and socializing. A chord struck hard – even though I was with my batch and Neetha with hers – I was constantly, unconsciously, watching and noticing her! It might seem silly, but a healthy watch! It was dusk when we stepped Tumling. Through the uphill I started feeling cramps and sprain on my left knee and consulted the camp leader who suggested a pain killer and stated it should be fine. We had a camp fire that night and kick started with our favorite Antakshari (music game) and slipped into the mime game of Dumb Charades. Neetha knew a vast majority of the old songs and would sing at least a line of it which I owe her credits for. Back in the tent I let her know of my knee sprain and was uncertain of the next day trek when she pitched in with an inspiring note of “everything would be fine and that I would certainly be able to trek” the trek was from Tumlong to Kalapokhri which is roughly about 10 kms. I started the journey the next day on a positive note and throughout the trek she kept checking on me if everything was alright with my knee. That was one of the first experiences for me, not with the trek, but with someone interested in my well being on a constant note. My pain started to overtake me than the destination and somehow I managed to push Neetha to go with others since I knew I could be the reason for her delay if she hangs out with me owing to my pain. It got darker and my eyes felt the pinch of the knee. I managed to reach the base camp at Kalapokhri and the camp leader was kind enough to wait for me outside of our accommodation. When the camp leader was asking me of my injury, walked in Neetha to console and comfort me. Every other camp member gathered for the night’s campfire. We headed for dinner and the camp leader asked me to join him in order to learn massage for the knee with an ointment and wrap with a cloth around. Neetha took it as her responsibility that helped me realize – a friend in need is a friend indeed! I did fall asleep in comfort. WhatsApp alarmed with a message to which my eyes were surprise – “I am Happy with you”. Another one beeped while the first one was being relished and digested “Stay the way you want… But got to stay here with me only…” probably I was resonating on the fact that she is the first person from whom I have heard such words making me feel wanted! Simple messages made me feel so contended? One may ask what was so special, that made me feel very exceptional? When many a time I feel not so related from others because of the way I perform or want things to be performed, this one added a special feather to my hat. I win my arguments and choose my style of gliding through situations which has what has kept me aloof from the crowd and which has what surprised me when the intonation came from Shweta. Within 10 days she had adjudged that she likes me and that she wanted me to stay the way how I was. There could be many a differences that set us apart, after all, any relationship strengthens through the understand of differences than similarities. She has the ability to read people’s mind which is yet to be eternally gifted with. She analyzes all circumstances with their pros and cons weighing upon the next set of actions from her end, which I am yet to handshake with life. Checking on a balanced state of mind is her natural tendency, when I get typically emotional given a chance. Two different characters, state of mind, maturity and thoughts, came together on the balance of friendship to learn from each other.